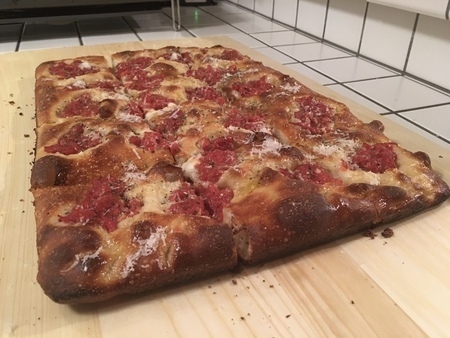 The Pizza Bible - First Sicilian! I was pretty happy with how it came out, considering I only have an aluminum pan (will be investing in steel now that I've tried it out). It wasn't quite as fluffy/light as I would have liked - and I noticed that it didn't really rise in the pan pre-parbake as much as I would have thought, even though I let it sit on top of the pre-heating oven. I may have taken it out of the fridge too early, as it wasn't really 24 hours after putting it in. Or, I am thinking maybe the Poolish didn't mature enough. I left it for 12 hours, but due to timing had to use it then. It was def. more than doubled in size, maybe even tripled though. Looks great for your first try! The black Sicilian pan recommended in the book really makes a huge difference in terms of browning and oven spring. I used my pan several times and couldn't be more happier with the results. You will not be disappointed with All-Trumps flour. I have been using All-Trumps flour for months and I have had excellent results. Prior to All-Trumps, I had used King Arthur High-Gluten, which was good but I do not think it was as good as All-Trumps. I purchased a Black Sicilian Pan from fgpizza.com, you will find a trove of goodies on their website. While I have not made a Sicilian style pizza in the pan, I have made Focaccia. I thought the dough was supposed to rise more and maybe it is, but it was still incredibly delicious. Great work for your first try. Looks delicious. You're right, it will rise more with the steel pan and have a more golden brown fried crust. In my humble opinion, half the battle with pizza making is having the right equipment. The rest is quality ingredients and lots of practice. I’ve learned from each pizza I’ve made.